Principle of Operation Utilizes a combination of germicidal UV lamps, filters and blowers for controlled flow of purified air. 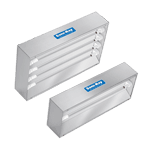 Indirect fixture utilizing germicidal UV lamps and a series of specially designed louvers to direct UV rays to upper portion of room. Must be installed on wall at 7 feet or above. Portable sanitizer utilizing multiple lamps, providing direct UV rays to disinfect entire areas (large rooms) very quickly. Equipment designed with germicidal UV lamps specifically for heating, ventilation and air conditioning systems. May be installed in new or existing ducts. Direct germicidal UV rays are emitted in long, unobstructed lines providing areas and surfaces with destruction of microorganisms. Direct germicidal UV rays are emitted in widespread path providing areas and surfaces with destruction of bacteria, mold, and virus. A variety of small, low wattage fixtures for direct UV disinfection. Ideal for limited spaces. Designed explicitly to treat the air in the head space of a liquid storage tank in order to prevent condensation and product contamination. 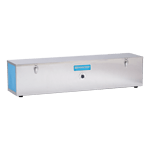 Germicidal UV ozone lamps generate high levels of UV radiation lethal to infectious microorganisms, removing mold, smoke, and other strong odors. Our ultraviolet air and surface purification lines are designed for your commercial and industrial applications — with the exception of the AeroLogic®, that can be used in residential, commercial, or industrial settings. All models use STER-L-RAY ® Germicidal UV-C Lamps that emit a UV wavelength highly lethal to virus, bacteria, and mold spores. Everyone benefits when UV-C radiation reduces incidence of MRSA, C. Diff, and TB — and everyone benefits when UV virtually eliminates cold and flu germs. Cross contamination is reduced, providing healthy, pure air and relief from allergies and asthma. 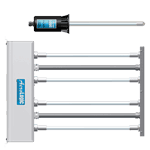 The SANITAIRE® uses a combination of germicidal UV lamps, washable electrostatic, absolute HEPA, or disposable particulate filters, and blowers for controlled flow of purified air. It continuously disinfects the air in occupied spaces with virtually no maintenance. The Hygeaire® purifies upper room air in occupied spaces, reducing the risk of cross infection by virtually elminating infectious airborne microbes. It uses a unique, variable–output version of our Surelite™ Electronic Ballast with an adjustable feature mounted on its base, allowing purchase of one model that can be used in many different sized rooms. The Sanidyne® is the portable solution where a permanent sanitizer is not an option, allowing you to sanitize the air and exposed surfaces in unoccupied areas as needed. A 1,000 sq. ft. room can be disinfected in under one hour. Its portability also makes it an economical way to try ultraviolet disinfection in your application. There are several models to choose from. The AeroLogic® installs inside your new or existing HVAC air ducts. This unit eliminates airborne microbes inside the ducts so that fresh, pure air enters the occupied room. Several models are available for most home, commercial, and industrial HVAC units. Sani-Ray® fixtures are mounted on the wall or ceiling to disinfect air and surfaces in unoccupied spaces. Their highly reflective, polished specular aluminum surface maximizes UV intensity. In addition to the standard models available, we can custom design a fixture for your application. 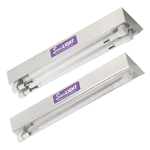 SaniLIGHT® is very effective on air and surfaces in unoccupied spaces due to long, unobstructed UV rays — and ideal where frequent starts and stops are required. Cold cathode lamps are available for applications where the temperature is colder than room temperatures, such as walk-in refrigerators, meat lockers, or holding rooms. The Biolux® line provides direct germicidal UV exposure for small spaces like conveyor belts, disinfection cabinets, or laboratory hoods. Strip style, hand-held, and stand style fixtures can be used in unoccupied spaces, or occupied spaces with protective measures. They are constructed of stainless steel, polished chrome, or specular aluminum, depending on the model. The Nutripure® circulates purified, filtered air within liquid storage tanks in order to provide a sterile condition, defeat contamination from airborne sources, and lower condensation levels that can dilute tank contents. Models are equipped with washable electrostatic, absolute HEPA, or disposable particulate filters. Since lamps are completely enclosed within a stainless steel exposure chamber, these models are safe for use in occupied spaces. 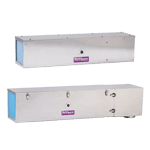 Monozone™ Ultraviolet Ozone Generators utilize STER-L-RAY ® Germicidal Ozone-Producing Lamps that remove mold, smoke, and other strong odors. These models effectively deactivate infectious microorganisms including bacteria, mold, and virus, and are available in a number of different configurations to adapt to any setting.